primer for any finish coat. Fertan is a complex, patented tannic acid product offering exceptional protection against rust. Fertan converts loose rust to powder which can be washed off leaving a stable and inert surface. Rust is eliminated and new formation prevented. Fertan when kept in closed containers and reasonable conditions has an unlimited shelf life. 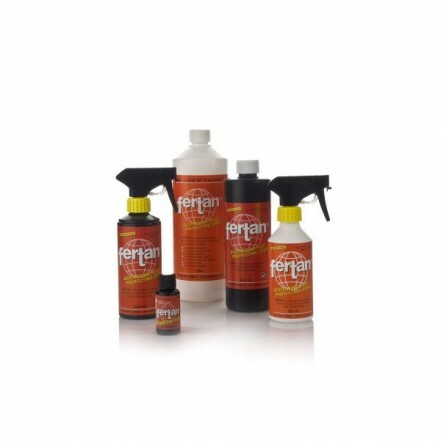 Brush off loose rust and remove dirt, oil or silicone products that will prevent Fertan reaching the metal surface. Apply Fertan by brush, roller or spray and leave for 24 hours, extending this to 48 hours in low temperatures. The surface can now be rinsed off and overpainted. The overpainting can be left for weeks, months or years depending on the environmental conditions.